I’m excited to introduce a new series on the blog: Kitchen Tips! These are not recipes per se, but suggestions of how to use your veggies in ways you may not have considered. For my first post in this series, let’s talk about purple green beans. These showy legumes are one of the great joys of summer produce. Their contrasting deep purple outside and bright green inside are a delight to look upon. What a disappointment though when they hit the pan or pot of boiling water and seconds later the purple has completely disappeared only to be replaced with a drab green. And so, I present to you Kitchen Tip #1: eat your purple green beans raw. Slice your purple green beans on a bias and you get the best show. Flashy purples and greens can now take center stage on the plate. The icing on the cake? Their sweet crunch adds fantastic texture to any salad or side dish. This week at home, I sautéed up their yellow and green cousins with some tomatoes, onions, and garlic. Once they were done and on the platter, I topped them off with raw purple beans and some oregano flowers from the garden. Voila! Dinner was served. The summer garden is in full swing, which means lots of refreshing herbs are now easy to come by! Lemon balm and sumac add hints of citrus while the rosewater gives just the slightest floral hint. If you cant find lemon balm, any mint would be a great substitute. This simple recipe makes a great dip for pita chips or you can use it as a mellow dollop on a spicy curry. Combine all ingredients except rose petals in a mixing bowl and stir until well incorporated. Pop the mixture in the fridge and allow the flavors to combine for about an hour if you can. Place the yogurt mix in a serving bowl and top with rose petals. This should keep in the fridge for 3 days. Strawberry season is upon us! This is a cause for celebration and a great excuse to enjoy strawberries with every meal! Here’s a simple recipe to use up your super ripe strawberries. I’ve made a couple batches of this – one for immediate use and another tucked in the freezer to enjoy this winter when I’m longing for sunnier days. 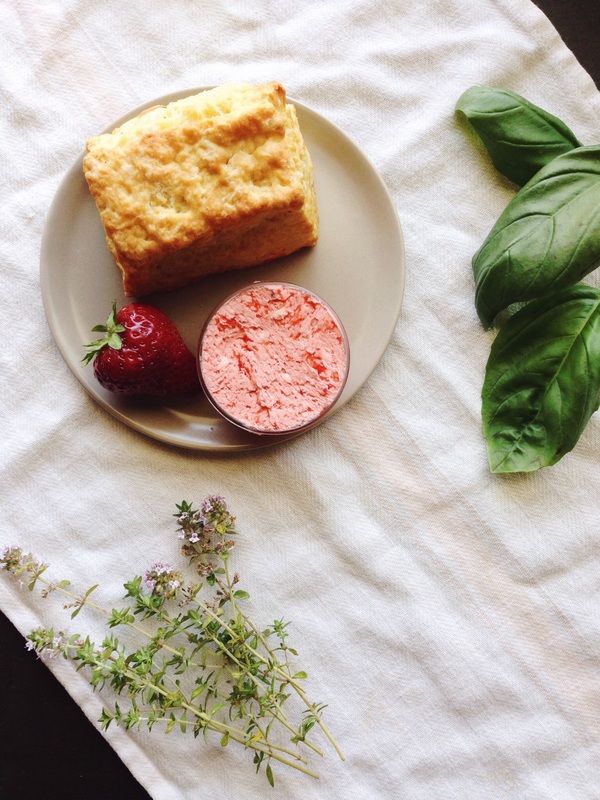 Enjoy your strawberry butter on biscuits, pancakes, in between layers of cake, or any other way you can think of! For an extra special treat add some herbs to your butter or a dash of rose water. Roughly chop or mash your strawberries with a wooden spoon. Place strawberries in a stand mixer and turn on medium speed. Once the strawberries are well macerated, turn of the mixer and add your butter and salt. Turn mixer on high and whip until the strawberries and butter are well combined. Note: you may want to hold up a dish towel or place some plastic wrap around your mixer to prevent strawberry juice from splashing everything in the near vicinity. If using herbs or rosewater, stir them into the butter at the end. Roll your butter into a log using parchment paper and refrigerate or place in the freezer. Enjoy!